We are in the midst of enjoying the divine glories of AzhwArs/AchAryas who appeared in this auspicious month of aippasi. 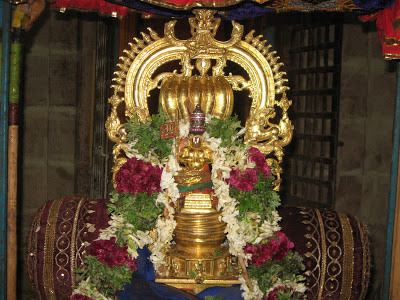 Please view http://ponnadi.blogspot.in/p/aippasi-thula-masa-anubhavam.html for full glories of this month. 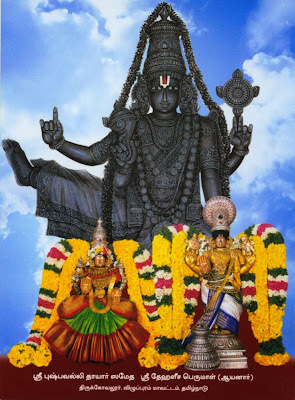 Let us enjoy the divine relationship between mudhalAzhwArgaL and emperumAnAr through the divine words of thiruvarangathu amudhanAr's rAmAnusa nURRanthAdhi and mAmunigaL's vyAkyAnam for the same. amudhanAr compiled rAmAnusa nURRanthAdhi which is declared as prapanna sAvithri by our pUrvAchAryas. mAmunigaL explains in the avathArikai (introduction) of his explanations to rAmAnusa nURRanthAdhi that just like gAyathri manthram is to be recited everyday (by thraivarNikas), this is to be recited everyday by prapannas. By the divine will of srI ranganAthan, this prabhandham also became part of 4000 dhivya prabhandham similar to kaNNinuN chiru thAmbu. Both kaNNinuN chiru thAmbu (sung on nammAzhwAr by madhurakavi AzhwAr) and rAmAnusa nURRanthAdhi (sung on srI rAmAnuja by amudhanAr) establish the charama parva nishtai (ultimate position of devotion towards AchAryan). In this dhivya prabhandham, the first 7 pAsurams are said to be the introduction part by amudhanAr and the real content of the prabhandham starts from the 8th pAsuram. First, amudhanAr starts explaining emperumAnAr's glories in connection with the AzhwArs and AchAryas. For the aippasi anubhavam, let us now enjoy the pAsurams (8,9, 10) glorifying mudhalAzhwArgaL (poigai AzhwAr, bhUthathAzhwAr and pEyAzhwAr). Translation (based on mAmunigaL's explanations): Ignorant people consider that they are being troubled by natural forces (agni, vAyu, etc) independently without understanding that srIman nArAyaNan is the controller of everything and the dhEvathas simply execute his orders. poigai AzhwAr who is an important AchArya for the prapannas, is most generously revealing the in-depth principles of vEdhAntham in very beautiful (and easy to understand) thamizh language. Being cramped for room in the idai kazhi (porch) at thirukkOvalUr by srIman nArAyaNan, he lit the lamp of knowledge through mudhal thiruvanthAdhi 1st pAsuram "vaiyam thagaLiyA" (வையம் தகளியா). emperumAnAr who has boundless glories, who dearly retains those principles revealed by poigai AzhwAr in his heart is our master. Translation (based on mAmunigaL's explanations): Our heart is the tool through which we can understand our true master srIman nArAyaNan. But that is covered with darkness (ignorance). 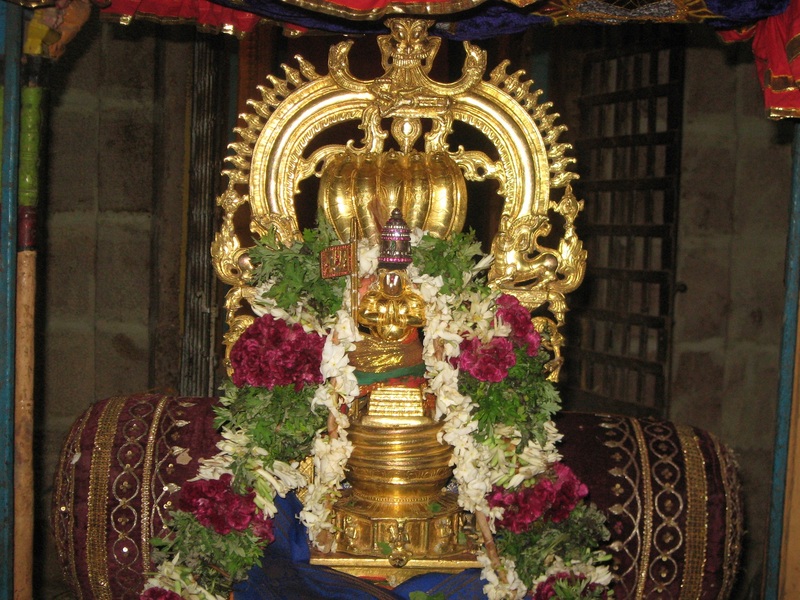 bhUthathAzhwAr who is our lord, lit the lamp of paragyAnam (advanced knowledge) in iraNdAm thiruvandhAthi 1st pAsuram starting with "anbE thagaLiyA" (அன்பே தகளியா) upto "gyAnachchudar viLakkERRinEn" (ஞானச்சுடர் விளக்கேற்றினேன்). emperumAnAr constantly meditates on such bhUthathAzhwAr's lotus feet and enjoys that anubhavam. Such emperumAnAr's followers who constantly highlight the auspicious qualities of emperumAnAr will protect the vEdham which cannot be destroyed by bhAhyas (one who dont accept vEdham) and kudhrushtis (one who accept vEdham but mis-interpret the meanings). Those followers of emperumAnAr will also establish the principles of vEdham very precisely. Translation (based on mAmunigaL's explanations): After the darkness of ignorance was dispelled by the lamp lit by poigai AzhwAr and bhUthathAzhwAr, as highlighted in mudhal thiruvanthAdhi 89th pAsuram "nIyum thirumagaLum" (நீயும் திருமகளும் - You and srI mahAlakshmi), pEyAzhwAr has the divine vision of emperumAn with srI mahAlakshmi and the auspicious qualities of krishNAvathAram (where emperumAn was totally at the disposal of his devotees) at thirukkOvalUr. pEyAzhwAr who is the master of thamizh language, describes this divine vision in mUnRAm thiruvanthAdhi 1st pAsuram "thirukkaNdEn" (திருக்கண்டேன்). emperumAnAr hails such glorious pEyAzhwAr's lotus feet. The persons who have the greatest wealth of considering the lotus feet of the ones who have love and attachment towards emperumAnAr (who glorifies pEyAzhwAr's lotus feet) as the flowers that decorate their heads are always most exalted. Thus we have seen the divine relationship between mudhalAzhwArgaL and emperumAnAr through the divine words of amudhanAr and the most beautiful explanations given by mAmunigaL. Let us bow down at the lotus feet of mudhalAzhwArgaL, emperumAnAr, amudhanAr and mAmunigaL and be blessed.